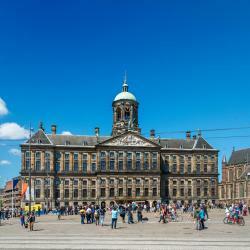 Looking for hotels near Royal Palace Amsterdam? Set in the heart of Amsterdam, Prinsenhof Suite is a 3-minute walk from Dam Square. 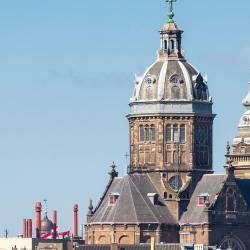 Built in 15th century, the property is within 1312 feet of Royal Palace Amsterdam and Beurs van Berlage. Featuring garden views, Huis Roomolen centre Amsterdam has accommodations with a terrace and a coffee machine, around a 15-minute walk from Basilica of St. Nicholas. Hotel Estheréa is set along the Singel canal in the center of Amsterdam, only 984 feet from Dam Square. This hotel is in a quiet area and benefits from classically-styled decor with wooden paneling. Friendly and very helpful staff. Staff would go to any extent to delight guests. The Hoxton, Amsterdam, made up of 5 canal houses, offers accommodations in Amsterdam and features free WiFi and a restaurant. The rooms are equipped with a flat-screen TV with cable channels. A really cool ambiance, modern, the opposite of stuffy. Within walking distance of the Central Train Station and the main attractions, you can find the perfect starting point for exploring Amsterdam. Wine in the day of my anniversary. It was a nice touch! Built in 1678, Canal House Suites at Sofitel Legend The Grand Amsterdam is located on the 2nd oldest canal of Amsterdam. This hotel features free WiFi. 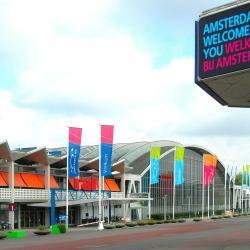 Best location for transit travellers in Amsterdam. Manofa offers simply furnished rooms in Amsterdam, 5 minutes’ walk from Dam Square and Amsterdam Central Station. It benefits from a 24-hour front desk and vending machines in the lobby. The room viewing Damrak street. Very nice room, small but cozy. XO Hotels City Center is set in 10 monumental townhouses, around the corner from the lively Dam Square and Warmoesstraat area. It offers accommodations with flat-screen TVs and private bathrooms. Wonderful place to stay in heart of Amsterdam. 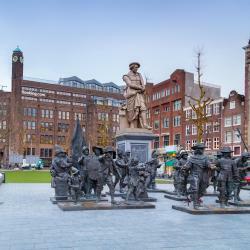 Rokin Hotel is in a great location in the lively heart of Amsterdam, only steps from Dam Square and within a short walk from Amsterdam Central Train Station. Cleanliness, friendly stuff. It's great that there was elevator in the building. 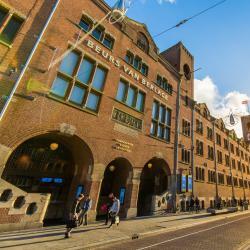 Orange Tulip Hotel is set right on the Damrak, 1640 feet from both Central Station and Dam Square. It offers free Wi-Fi and basic accommodations with views of the city scenery. beds are super comfy toilets are super clean i got a room with a good view! Hotel Di-Ann is a fascinating historic canal house, that offers a view along the charming canals of Herengracht and Keizersgracht. Of course the room. Quite spacious and a lot of windows. The bed is so comfortable! Hotels with great access to Royal Palace Amsterdam! Located near the famous 9 Straatjes shopping district, Hotel IX Nine Streets Amsterdam is located in Amsterdam. Free WiFi access is available here. Everything was wonderful. Will come back. The Highland House is a boutique hotel with luxurious and intimate atmosphere located in Amsterdam, 656 feet from beurs van Berlage. De Jordaan and the Anne Frank House are just around the corner. The interior of the room is really quirky. Overlooking the Singel Canal, NH City Center is a 5-minute walk from focal Dam Square. It features fine dining options, boat tours and a bicycle rental. Free Wi-Fi is available. Staff was super nice and helpful. Location is perfect.